NOW WITH COMPLETE SUPPORT FOR OPEN API 3.0.2 spec, full compatibility with Eclipse Oxygen, Photon, and 2018 releases. KaiZen OpenAPI Editor is RepreZen's open source, Eclipse-based editor for the industry-standard OpenAPI Specification language, based on Swagger. This is the same full-featured editor that powers Swagger-OpenAPI in the popular RepreZen API Studio solution. FULLY COMPATIBLE with OpenAPI 3.0.2, the newest version of the industry-standard API description language. Here's how you can get started with KaiZen and OpenAPI v3. Full OpenAPI 2.0 (Swagger) compatibility, the most widely used API description format. Content assist with custom templates. 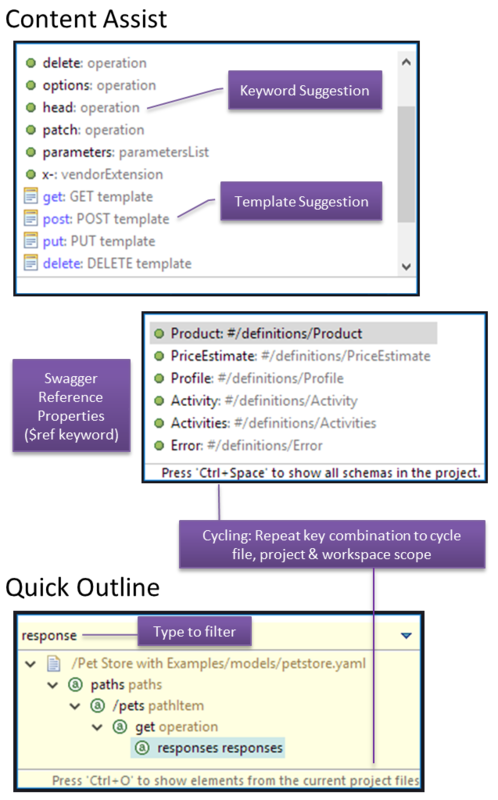 Scope cycling makes it easy to insert references to definitions anywhere in the current file, project or workspace. Quick Outline navigation with scope cycling, to navigate anywhere within the current file, project or workspace. Requires Eclipse Oxygen release or later. By adding the following code below to your website you will be able to add an install button for KaiZen OpenAPI Editor. COFIQ- Get Your SOA/API/Microservice Act Together!